When I first made Paleo Crackers I knew that wanted to make a healthy dip to accompany it. The first two dips that came to mind were Hummus and Guacamole. I knew of an awesome Curtis Stone recipe for guacamole, so I decided to make it and have adapted it slightly. 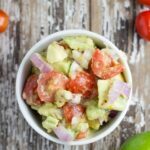 It is an absolute winner: an easy snack when you don’t feel like cooking too much or your new gluten-free go-to finger food when entertaining guests. All all ingredients to a medium and bowl and gently mix to combine.